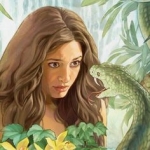 In this show Jonathan and I speak about the distinction between the seed of the woman and the seed of the serpent and how the great contest between Yahushua and Satan came about after the war in heaven and the rebel Angels exile here to the fallen Earth. We also explain how our own preexistence plays into the collective fall of humanity and our incarnation, birth into flesh form. It is in the flesh that we have all been given renewed opportunity to redetermine our allegiance with either light or darkness, good or evil, Christ or Satan. It is this choice which will determine our eternal inheritance and whether we are allowed a return to our former estate in Paradise.